Just because you’re on vacation doesn’t mean you should take a break from brushing your teeth! 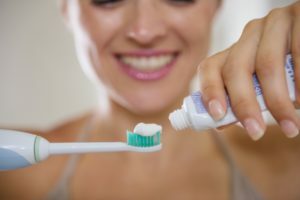 It is advised that you brush your teeth at least twice a day (after meals and before going to bed at night). There are many toothbrushes available in the market. Dr. Bakhtyari always recommends an ADA-approved soft bristle brush and fluoride toothpaste. Don’t forget to pack the floss. Flossing once a day is the most effective way to clean in the deep recesses between your teeth and down under the gum line. Flossing regularly also helps to disrupt plaque from building up and damaging the teeth, gums, and bone structures. Choose a therapeutic mouthwash that has active ingredients intended to help control or reduce conditions like bad breath, gingivitis, plaque, and tooth decay. Find your favorite mouthwash in travel size so it takes up less space in your travel bag. We all want to look our very best, particularly on vacation. Choose a whitening toothpaste that, has active ingredients intended to help control or reduce conditions like bad breath, gingivitis, plaque, and tooth decay but will also keep your teeth looking pearly white. Find your favorite toothpaste in travel size so it takes up less space in your travel bag. Dental emergencies and accidents are quite common while on vacation. Be sure to pack an emergency dental care kit to take along for vacation. Essentials for this kit, according to the Academy of General Dentistry, are a handkerchief, gauze, a small container with a lid, ibuprofen and of course our contact information. On vacation, you may opt for more sugary and acid drinks. Take some extra straws and drink your soda, juice or iced coffee with a straw to avoid contact with you teeth as much as possible. Take sugar free packs of gum or a pack of mints on vacation to help with digestion with new and rich foods and to prevent bad breath. Dr. Farshad Bakhtyari is the founder at Premier Dental Care and is a leading dentist around Reston, Herndon and Northern Virginia. Dr. Bakhtyari is an expert in general and cosmetic dentistry, is Invisalign certified and has gained a reputation of excellence in the dentistry community.